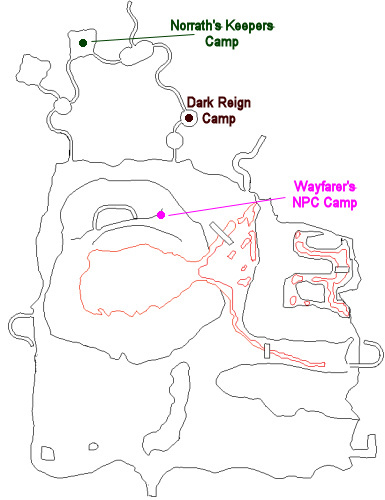 This solo task begins with Private Nylaen Kel`Ther (click for map image) in the Norrath's Keepers camp in the caves of Lavastorm Mountains (/loc 3750, 470). You have been assigned the task 'Snowfoot Revenge'. Kill 10x "a Snowfoot _____" goblins in The Ascent, found towards the summit (you'll need to head up towards the top of the zone before you see these mobs). You have completed the task for Norrath's Keepers! A Snowfoot Perserver also counted as a mob that update the task. It was the last and only Snowfoot left in zone. Your task 'Snowfoot Revenge' has been updated. Your faction standing with Norrath's Keepers got better. Your faction standing with Firiona Vie got better. Your faction standing with Lanys T'Vyl got worse. Your faction standing with Dark Reign got worse. Good luck if you aren't a solo class. Lots of SI so you have to kill your way up. Then of course the mobs run. Root breaks quick. After an hour at it and only making it up halway I just gave up. Just letting you guys know.. I was unable to get at level 68, dinged 69 last night and hailed the cheif. I received a flag and was able to hail Private Nylaen and got all 3 Tier 3 DoN quests. Please update the info. May Karana Bless You with Rains when YOU need them, and your enemies with Drought when you need it. Been killing all the gobs but can't find 1 snowfoot in the ascent where are they hiding? Past the click portal to go up to second half. Once you get through the cave to the snow part at top, you start to see them. Then more up in the snow itself. I am at amiable faction with the Norrath's Keepers and I was able to get the 3 "solo" tasks for tier 3. Only amiable is needed. I just went from kindly to amiable and now have all the solo tasks for tier 3. For Teir 3 you need mid-high amiable. Finally was able to get the solo tasks. Was a bit confused when I /conned amiably and got no positive response from any of the questors in the NK camp. I usually try to turn in the token after raids and went to the quest givers and hailed them and finally got a character flag. Mid-high faction, indeed.